What follows is a fast response to the FRONT PAGE comments of the Sheldon roundup contractor, Cattoor Livestock (Cattoor) . The contractor is the chosen contractor of Sheldon National Wildlife Refuge and has done operations at the refuge for about a decade. Magnificent horse fights for freedom… Isn’t freedom a core American concept? I did not go through “hours and hours” of searching to post the pictures I posted. The pictures I posted were random samples of the events of the days I was there. During the operation, we were placed in areas where being able to clearly see what is happening is difficult… one looks for pictures to post where the viewer can actually see horses (it is that simple).The majority of the pictures Cattoor references I did not post in the context claimed by Cattoor, or I did not post at all. The white horse pictured above is a stunning shot of a horse fighting to gain it’s freedom. I personally find these images both beautiful and tragic. 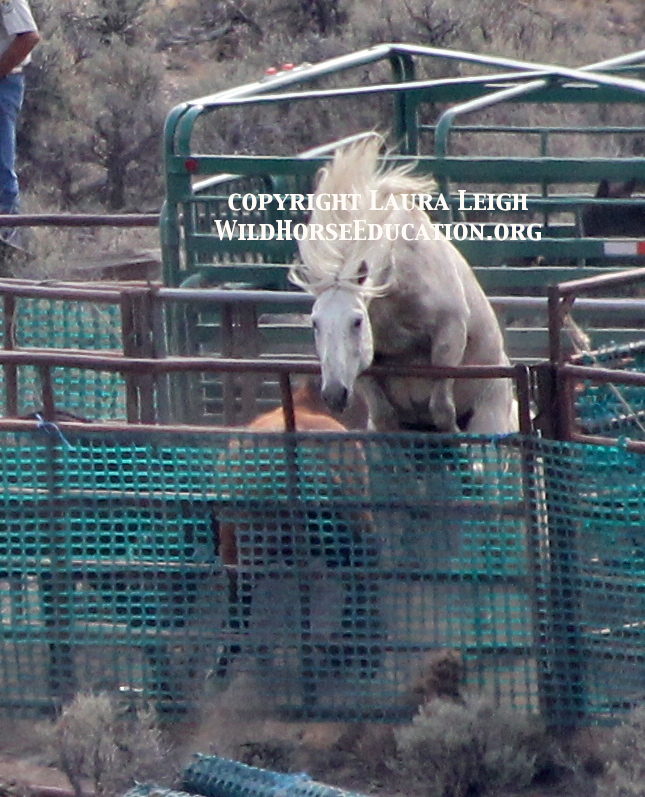 That horse was free on the range and is now captive, but in that moment continues to fight for freedom. To me those images embody that spirit of the wild horse as “living symbol of the pioneer spirit of the West,” the spirit that fights for freedom. (Although people have a real tendency to think everything is about them, that picture is about the magnificence of that horse). I posted the photo of the first foal roped that we actually saw, then I commented that this was a “zero out” roundup and that all horses needed to be removed. I remarked that “the rider matched the stride of the foal perfectly, closed distance before roping and then slowly allowed the foal to realize he was captured.” The horse with the broken leg that was euthanized? I do not have stills, I only have that on video. The video has not been released, as of yet. I was not there for the burro that was brought in (I was at a speaking engagement). There are multiple photos Cattoor does NOT reference; the two geldings that stared down the chopper, the foal that had been driven into the pen and was caught in there while studs were fighting, then taken out to avoid injury and loaded on the trailer, as well as about two dozen other shots that WHE published. This roundup is to zero out the refuge and all must go. On my first day of observation Sue Cattoor, the lead for Cattoor, came to my truck. I had two people with me on that first day. One of them actually documented Sue’s conversation with me. Sue has a longstanding concern over images that surfaced in 2006 of foals at Sheldon run in the heat of June and then hog tied in the desert. I did not take those photos. They were taken by Flora Steffan, a contractor at the time who was slated to take Sheldon horses and who was later caught selling the horses to slaughter (that Sheldon bought back). Flora released those photos AFTER getting caught and (rumor has it) not getting paid. Those images (and intercepted conversations of radio communications during the roundup) were released by another organization in 2006. Almost every time I see Sue she wants to talk about it and is angry that I reference them in articles. (In recent articles I note the photos and say “allegedly left to die ” I do not take credit for them and I have focused primarily on what is happening now). Sue tells another story of that incident in 2006. I asked that she write the story. She sent me a very long letter outlining the events that she says surround those photos (in winter of 2012). I asked for her permission to print it. She has not given me permission yet wants me to take the pictures down. The pictures are out there on multiple sites. The deaths happened. If there is another account of the events besides the one that was released, Sue can release her own account… I even offered to print it. Two horses that bear the brand of being infertile (many Sheldon horses were given vasectomies or hysterectomies) must be removed as well instead of left to die free. However it gets even more complicated. Right now the public is in an uproar over Sheldon. I have never known an area to have so little actual public involvement in process, yet generate so much hostility on both sides of the fence. I have written nothing but the truth about why Sheldon is removing horses and burros. It is NOT a rescue but a carefully crafted plan, begun many years ago, to remove all Sheldon horses and burros because they do not fit in with the mission of the refuge (it is all in their CCP that takes years to write). The lack of accountability in placement of the horses and protecting them is very well documented in papers filed with the federal courts in 2013. After litigation and a Congressional inquiry, Sheldon issued a stop work order to the J&S contractor and has “reviewed” contracts. We hope that this is to ensure the safety of the horses and not just to stop inquiry… however there appears to be even more people drama brewing, associated with the placement of horses. This drama seems to be spurred, not by what is happening now, but by the ongoing contentiousness about the issues that began in 2006. That “drama” has not played out yet… we will see what happens and let you all know. If you want to see what we wrote about Sheldon and what we have released… it is all on the WHE website. But it is time for people to stop accusing WHE of actions taken by others both now or in the past. Yes, there are things we will take “credit” for. A lot of attention has been drawn to helicopter roundups in general through my documentation and legal actions. We gained the first court orders from federal judges in history against inhumane conduct…. and we continue to gain more ground in court… against BLM. In court it is the authorizing agency that has jurisdiction (in those cases the BLM) and the authorizing government agency is the appropriate defendant in such matters. The contractor is simply an agent of the authorizing agency (therefore this is not an issue of the private property of the contractor). We can not make any distinction between contractors in litigation. We can address the manner in which the government either follows, or does not follow, mandates of law. This is also something that has caused contention, WHE can not directly address the contractors legally, just the authorizing agency. Sheldon is OVER. There will NEVER be Sheldon herds of mustangs in that amazingly beautiful place again. Those horses that allowed you to enter their world and take a step back in time are lost to us forever. I LOVE those horses… why do those involved in their removal literally hate me for it? Is it because of the attention our work brings to actions they would rather not have the public aware of? There are over 300 Sheldon horses sitting in holding corrals and about another 80-100 that will come off next month. WHY is the focus on 2006… and not on placing the last of the Sheldon Mustangs safely? I have documented those horses for the last four years on a consistent basis… why is it wrong for me to want to see them treated with the best we as a nation can give to them? Why would it be wrong for me, for us, to care if a band is driven in and their baby is not with the band, and babies are limping in holding? Why is concern over any possibly inhumane aspect of this removal wrong? Why? Why is this becoming about people and not about the horses? And WHY does this horse have a tracking collar? There is also a reference on the contractor page to a public observer, an assistant of Temple Grandin. This is just one of many instances where a hand-picked member of the PUBLIC is given access to evaluate the condition of these horses, while the rest of the representatives for the public, requesting access (like WHE) are denied that access. This type of thing occurs with regularity. Apparently the asserted FAA regulations (which are not specific to wild horse roundups or roundups could never happen) , don’t apply to people that are hand-picked to be allowed to violate such asserted regulations. The decision to allow access to Temple Grandin’s assistant was made by the contract staff, not the government agency.